Straight-up crispy treats are (as the name implies) always a treat. 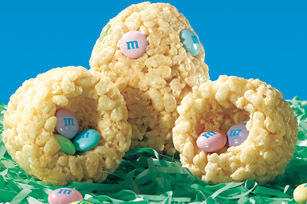 But for Easter, these egg-shaped yummies have candy surprises tucked inside. Coat insides of clean plastic eggs with cooking spray. Melt butter in large saucepan over low heat. Add marshmallows; cook and stir until completely melted. Remove from heat. Add cereal; stir until evenly coated. Press 1/4 cup cereal mixture (with greased hands) firmly into each egg half, hollowing out center. Remove from molds. Place on sheet of waxed paper. Cool slightly. Place about 6 candies in one half of each egg. Gently press both halves of each egg together. Cool completely. Microwave butter in large microwaveable bowl on HIGH 45 sec. or until melted. Add marshmallows; toss to coat. Microwave 1-1/2 min. or until marshmallows are completely melted and mixture is well blended, stirring after 45 sec. Continue as directed. Prepare using 1 pkg. (10 oz.) regular JET-PUFFED Marshmallows. Let the kids decorate the eggs with ready-to spread canned frosting and additional candies.